After spending last year's event in the front seat of a lead car, I got the opportunity to take part in this year's Cape Rouleur as a Ride Captain. That's like the guy who drives the luggage van at the airport being promoted to pilot and told to have fun, while being responsible for the safety of all the passengers. A tall order, but one that I looked forward to. My first order of business in my new found position was to meet my fellow co-pilots - Flash, Captain and DT, and then the people we'd be sharing the road with over the next couple of days. 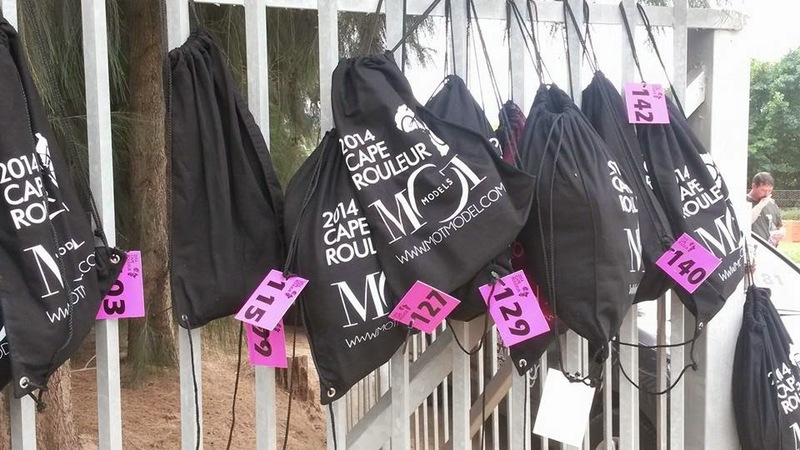 As the riders slowly trickled into Franschhoek, a sense of nervous excitement started to build. Many of the riders had endured some rather damp and soggy hours in the saddle during the recent inclement European winter, in the hope of arriving in South Africa with some semblance of form, and were eager to measure their progress against their fellow competitors. The tell tale sign as to a rider's origin was the colour of their skin, with the pasty, pallid Europeans sticking out like sore thumbs. To seed the 150 riders into their appropriate groups based on ability, the Cape Rouleur starts with a rather vicious 7km time trial. And to make the Europeans feel slightly more at home, the heavens had opened just before the scheduled start. With the locals wearing all the kit they owned in a bid to stay warm and dry, and the Northerners running around like ducks in the rain, the riders set off in batches on the out and back course, in order to set a time that would determine their fate for the next couple of days. Ride too fast and you'd spend 3 days rubbing shoulders with the racing snakes, biting down on handlebar tape and chasing wheels, while if you took it too slowly you'd get the scenic option and be in contention for the "Most Cycling" award. Get the speed just right and you'd end up in the Goldilocks group - Group 2 - the social racers' group. We'd race hard, but get plenty of opportunity to look around and enjoy the magnificent surrounds of the Western Cape. With the time trial behind us, Group 2 lined up on Monday morning in the streets of Franschhoek, a rather diverse collection of riders. We had bankers and orthopaedic surgeons, cricketers and celebrity chefs, and lots of people "involved" in private equity. We also had the honour of hosting the racing ladies, which not only upped the level of competition in the group, but also made Group 2 the best looking group out on the road. The riders of Group Two also had a wide range of skill levels, ranging from the seasoned veterans, to the and complete novices, and all those in between. Yet this didn't seem to matter as today we were cycling companions, united by our common passion of sleek, two wheeled, racing machines. Stage One was a warm up, both in terms of riding as well as the scenery, as we eased into the routine of the coming days. A nice long roll out of town at a comfortable conversational pace, followed by 20kms of helter skelter lung burning racing, before returning to the more sensible pace for the trip back home. All this was interrupted by a very civilised lunch stop each day to refuel the legs and chat about the stage so far. Gentleman (and gentlewoman) racing at its best. The added bonus being that we did all this with rolling road closure in a safe and controlled environment, managed and organised by the very capable ThinkBike marshals (aka Our Guardian Angels). While the wind caused some havoc during Stage One, there was another silent assassin that was stealthily creeping through the peloton, causing chaos, panic and confusion wherever it struck. A particularly potent version of Gastroenteritis was doing the rounds, and no one was safe. Toilet paper became a valued commodity, being traded in dark corners and shady locations, and it wasn't unusual to see riders carrying their own supply of baby wipes in their jersey pockets with a rather concentrated look on their faces. Stage Two dawned with the mountain goats licking their lips - we were leaving behind the flat lands of the Swartland, and heading into the hills. Those that had avoided The Plague so far were in for a tough day out, with 3 big climbs to look forward to, and some rather spectacular Overberg scenery to distract them. After only one day of riding, the changes in Group 2 were quite visible too. The riders were more confident and more cohesive - working as a well oiled machine as we ticked off the miles. The nervousness and uncertainty of the previous day a thing of the past. 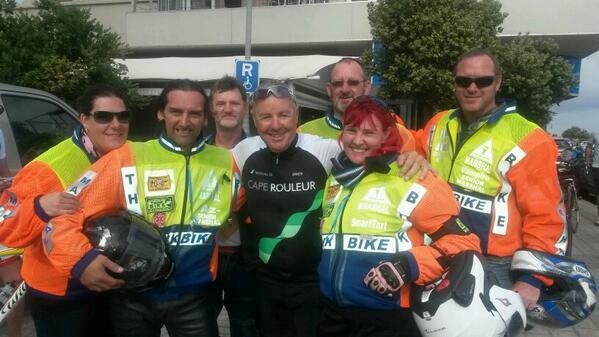 As further testament to our Goldilocks status, Stephen Roche had decided to ride with us. If ever there was an opportunity to learn how to ride a bike, now was the chance. Once again, the racing ladies didn't disappoint in the timed section, which set everything up for a very interesting final stage. Up front, our new resident Triple Crown winner was mixing it with the best Group 2 had to offer, and despite carrying a few extra winter kilos (much like Flash, our pregnant Ride Captain), Stephen's skill, power and agility were on display for all to watch - if you could keep up. After regrouping, catching our breath, and stocking up on fluid, we had one more challenge for the day - rolling into Franschhoek ahead of Group 1. The only thing standing in our way was Franschhoek Pass - a 7.6km climb at an average gradient of 5%. With determination and sheer will power, each and every rider in Group 2 turned themselves inside out to get up that climb as quickly as possible. Being the first group to roll into Franschhoek made it all worth it, bragging rights, Häagen-Dazs ice cream and cold beer being our reward. Stage Three was the queen stage - a monster 208km stage again finishing with a climb up Franschhoek Pass. The day started with a scenic sunrise ride through the winelands of Stellenbosch to one of the most beautiful roads in the Western Cape, the road from Gordon's Bay to Rooi Els, before giving everybody one last chance to race. The ladies racing was down to the wire, with several speedy women still vying for top honours - a handful of seconds separating the top contenders. With one kilometre to go in the timed section there was still everything to race for, when, in the blink of an eye there was a touch of wheels, a blood curdling yell, and the smell of burning brakes. Two riders went down in the chaos, one rather seriously. In a display of bravery that will leave most men cringing, Genelle did a quick survey of the damage - phone, bike, body - in that order, without once wincing or flinching. After a welcome lunch break at Arabella Golf Estate which saw the medics working overtime, we were off - the remaining 80kms of the 2014 Cape Rouleur ahead of us. We'd all switched into survival mode, ticking off the kilometres one by one, whilst doing our best to enjoy what was left of the stage. Things weren't all bad, as there was still a constant buzz of chatter, a sign that while the bodies might be tired and sore, the riders were still having a good time under the African sun. One last time over Franschhoek Pass, a speedy descent and the finish line awaited the men and women of Group Two. We'd survived an amazing adventure on the roads of the Western Cape, enduring some diverse weather conditions and The Plague, enjoying the scenery and the company of the riders around us. We started off as fifty-something nervous bike riders, but ended as fifty-something accomplished cyclists, united in conquering the 2014 Cape Rouleur. A big thank you to all the crew who worked tirelessly to make this a special event, to the other Ride Captains for showing me the ropes - DT, Captain and Flash - I hope my piloting skills were ok for a baggage handler, and to all the guys and girls that made Group Two the Goldilocks group - thank you all for reminding us what a beautiful country we live in and for sharing 600kms of bicycling heaven. I hope to see everyone again at the next HotChillee event. Sounds like you had a fantastic time, despite the "runs"